As the hot summer months roll in, the combination of steady sun and lack of rain can easily dry out most any lawn. Watering your grass may seem like a no-brainer to combat a dry lawn, but incorrect lawn watering practices can actually do more harm than good. As an eco-conscious homeowner, you’re working hard to keep your lawn healthy while reducing your use of harsh chemicals and using water responsibly – so what’s the best way to keep the balance? Having a sustainable, healthy lawn that’s environmentally friendly starts with the soil. Making sure that your soil contains the right nutrients, minerals and microorganisms is crucial. As you continue your eco-conscious efforts, don’t forget about the soil even when it comes to watering! Too much or not enough water can have detrimental effects on your grass, leaving it prone to infections and disease. Many of these diseases are avoidable with watering best practices, which means no need for pesticides, fungicides and insecticides – keeping your family and pets safe and, your yard looking lush. Mold. Watering your lawn in the evening will leave the blades of grass wet or damp into nightfall. This makes your lawn susceptible to diseases. The water never evaporates, it just sits there, creating the perfect conditions for fungus to grow. Red thread is a common fungal infection in Maine that appears as dead grass and is easily spread by additional watering and runoff. Shallow roots. Short waterings on a daily basis encourage your grass to develop a shallow root system. In the long-term, this makes your lawn suspect to stress, diseases, and insect infestations. Instead, water your lawn thoroughly a couple times a week. Increase in pests, including weeds. Over-watering can attract female beetles which lay eggs in the soil. Moisture creates an ideal hatching condition, and suddenly, your lawn has a grub outbreak. Many weeds also thrive in wet yards, making it harder for your grass to grow. Drowning. Over-watering can be tragic for your lawn, and yes, it can happen. Too much water oversaturates porous areas of soil, depriving the roots’ ability to absorb oxygen. Eventually, the grass will suffocate and die. Water in the morning. The best time to water your lawn is in the morning before the sun is high and hot. Morning waterings ensure that the water doesn’t evaporate before it reaches the soil and that the grass is dry before nightfall. Know your lawn. Different soil types are going to need different amounts of water to support a healthy and robust root system. Ideally, a lawn needs 1 to 1.25” of rain each week. If your soil is sandy, it may require more water than a soil that’s loamy. Water deeply. A thorough watering a few times a week, depending on your soil type, will encourage your grass to establish a healthy and deep root system. The goal is to moisten the soil about 5 to 6 inches. In the long term, these deep roots help your lawn to be more resistant to drought. But remember, those scorching days are the exception to the rule and may require you to up your watering frequency. Monitor. As you water your lawn, look to see if the water is puddling, pooling, or running down the street. If so, turn off the water, let it soak in, and repeat. This can be caused by lack of topsoil, super dry soil (especially if you’ve been unable to water for a while), or soil compaction. Aerating your lawn can alleviate the compaction and allow the water to penetrate the soil to reach the roots. Also, if you notice brown patches in your lawn that aren’t responding to watering, you may want to explore other causes, such as a red thread fungal infection or a grub infestation. Be consistent. Watering your lawn is not mandatory – despite how the neighbors may make you feel. Grass can go dormant in the summer, but if there is a severe drought that exceeds a month, you may need to water for survival of your lawn. Being mindful of your lawn watering practices will help your lawn thrive. It’s also wise to make sure you’re using each drop of water responsibly. You should pay attention to the time of year and weather forecasts, as a rainy day should impact your watering habits. If you’re looking for trusted lawn care professionals to help you on your way towards an eco-friendly lawn care routine, give the team at Lucas a call. We are stewards of lawn, tree, and plant health that provide environmentally responsible lawn care options for the eco-friendly homeowner. 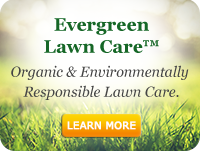 Select from our three Evergreen Lawn Care options that fit your vision for a healthy and eco-friendly lawn.